On January 6, 2019, a match between SHIRO and Phetsamret took place at the stadium in Nonthaburi Province, a suburb of Bangkok. 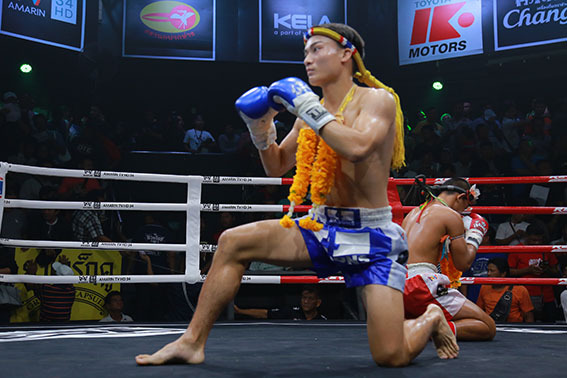 The match was a special occasion to celebrate the birthday of Chun Kietpetch　Who Muaythai’s world’s big hit promoter. The match was aired on Amarin Television all over Thailand. The match began with a 11 to 8 multiplier with an advantage at Phetsamret. 1R, Phetsamret hit Shiro with a mighty low kick. Although SHIRO is also a player who is good at low kicks, Phetsamret’s low kick aims at the outside of SHIRO’s legs. 2R, SHIRO and Phetsamret attack each other with a low kick attack. SHIRO grabbed his rhythm and was definitely doing damage to his opponent. A second voice rang out to attack SHIRO. 3Rs, Phetsamret, has been acting as Prime Minister of SHIRO. At the beginning of the 3Rs, Shiro’s multiplication rate was favorable, but it is disadvantaged by Phetsamret’s prime minister. 4R, SHIRO will attack forward to the front. Fight to never go behind. SHIRO calmly attacked his opponent, and Phetsamret slipped twice and fell. Phetsamret tries to kick, but SHIRO does not hit it. 5R, Phetsamret managed to aim for KO, but SHIRO’s defense was very tight, and Phetsamret was not able to attack as expected.